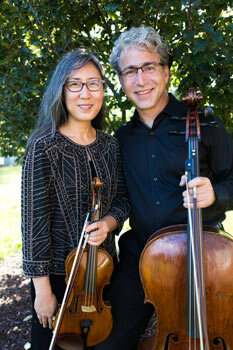 Miera Kim & Carey Bostian have concertized together since 2000. In 2015 they were invited to become the directors and core ensemble of the 501(c)3 organization Red Cedar Chamber Music, an organization founded in 1997. Under the auspices of Red Cedar Chamber Music, they bring innovative and entertaining concert projects and residency programs to broad and diverse audiences. Violinist Miera Kim has extensive orchestral and chamber music experience. She was named a member of the core ensemble and Executive Director of Red Cedar Chamber Music in 2016. Her extensive orchestral experience is reflected in her work as a professional violinist since the age of 16 with Orchestra Iowa. Miera has appeared frequently with the Quad-Cities Symphony String Quartet and the Maia Quartet. She studied with Jascha Brodsky at the Curtis Institute, Allen Ohmes at the University of Iowa and Doris Preucil at the Preucil School of Music. Carey Hoyt Bostian began cello studies at the age of 13. He actively promotes new music and frequently performs music of local and regional composers. Dr. Bostian has degrees from Northwestern University, Ohio State University and a DMA in cello performance from the University of Iowa. Since 1993 he has lived in Iowa City, Iowa, where he completed a MFA in orchestral conducting as the last student of James Dixon. An advocate of music education for the young, Carey is Conductor of the Iowa City Community String Orchestra, and formerly principal cellist of Orchestra Iowa. Red Cedar Chamber Music records exclusively for Fleur De Son Classics (NY). The most recent disc features the chamber music of composer Harvey Sollberger. In 2015 Miera Kim and Carey Bostian were invited by the Board of Directors of Red Cedar Chamber Music to become the directors and core ensemble of Red Cedar Chamber Music. They worked for a year under the tutelage of founders Jan Boland and John Dowdall, then took the reins of the organization on July 1, 2016. Red Cedar Chamber Music is a Cultural Leadership Partner in the State of Iowa.Independently, and under the auspices of Red Cedar Chamber Music, Kim and Bostian have commissioned and premiered scores of new chamber music works. The Iowa Arts Council has generously funded many of these commissions and performances. At the 2015 Washington D.C. Convention of the National Flute Association, Red Cedar Chamber Music performed by invitation on a Tribute concert to composer Harvey Sollberger: the 30 minute concert was devoted to Sollberger’s Suite for Silent Film commissioned by Red Cedar Chamber Music.